I consider myself to be someone who knows a lot about wrestling and the various forms of merchandise that has been released over the years. However, this gem completely escaped me. It’s the Hulkamania Workout Set made by LJN toy company. I’m a little sad that I missed the opportunity to run around the house and yell “What’chu gonna do” while wearing the Hulkster wristbands and headbands that came with the set. I guess I would have used the workout equipment at some point. I mean, come on, using the jump rope and 3 lbs. 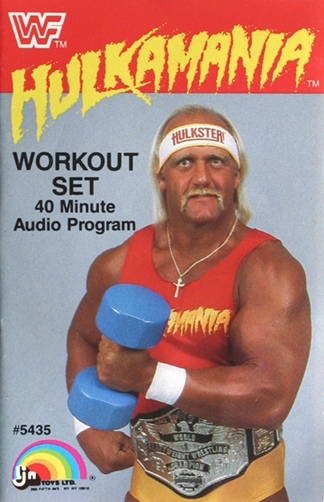 plastic dumbbells while listening to the 40-minute audio program narrated by Hulk Hogan himself would have been amazing. After all, I wanted my 24-inch pythons, brother! There was a television commercial to advertise the set, which was released in 1985. The thing is, it wasn’t Hulk Hogan breaking through the wall of a child’s bedroom to hype the product. It was “Mr. Wonderful” Paul Orndorff. It seems weird that Hogan would turn down a payday to shill his own merchandise. To be fair, Orndorff was a little more ripped than Hogan, and they were friends so I guess it was a way to convey the product’s potential. Now that I think about it, this is probably why Orndorff turned on Hogan a year later and joined the Heenan Family. Orndorff helped Hogan to his feet after being double teamed by Big John Studd and King Kong Bundy and then drilled him a clothesline that carried evil intentions. And for good measure, Orndorff followed it up with a piledriver in the center of the ring. Orndorff’s rage stemmed from a segment on The Flower Shop where he proclaimed to the world that it would only take one phone call for Hogan to be by his side. The call was made, but Hogan refused to answer. I would be upset too if I covered for a friend’s commercial shoot, only for that person to not even take my call. Wrestlers in the 80’s got very little time off, but Hogan got more than most. After all these years, I finally realized that I was rooting for the wrong guy. I wasn’t the only one. 74,000 people at Exhibition Stadium in Toronto were also cheering for the wrong person. The Big Event should have been Orndorff’s night, damn it. Well, that’s my conspiracy theory for one of the most memorable betrayals in wrestling history. I think the reason this stands the test of time is because for a lot of fans, this was their first heel turn, and it was done so well from conception to completion. If you want to learn more about the workout set itself, head over to Forces of Geek.com for an article written by Charles Knauf. I had this when I was a kid. I remember the beginning of the tape Hogan introduced himself as being “6 foot 7, two inches from heaven, and I weigh 3-Oh-5 and can whip any man alive!” I still have the two blue hand weights.